Now that the trickle of new digital SLR camera announcements has turned into more of a wave, there appears to be no end in sight. With the compact digital camera market saturated with hundreds of different models, manufactuers are starting to focus more on developing their SLR lines. What's interesting is that many of the new digital SLR cameras are starting to share the features commonly available on compact cameras: namely, video capture, LCD screens that flip out from the back of the camera, and face detection autofocus. The race for those making the transition from compact point-and-shoot to enty-level digital SLR is on and new models are being announced each month. Here's the best part for the average consumer: while the number of features on digital SLRs goes UP, the prices continue to go DOWN. Cameras with all the features you could possibly want (high-def video, dust control, image stabilization) now retail for less than $800 USD - a starting price that is about $400 USD less than a BASIC digital SLRs cost two years ago. There's one unfortunate side effect of all this competition between cameras - it's becoming harder to tell them apart. When I first started the Digital SLR Guide, I reviewed cameras based on their strengths and weaknesses - some were more suited for portrait photography while others were better for action. The digital SLRs of 2009 are kind of do-it-all marvels: they are designed to take all kinds of photos well. The issue of "image quality" - once a source of much discussion and disagreement between photographers - doesn't come up quite as often as it used to. That's because the image quality produced by ANY digital SLR in 2009 is superb (unless you're a professional in which case you're using an entirely different type of SLR). As more digital SLRs flood the marketplace, it will be harder for you to find the best one to suit your needs. In the end, pick the one that you get a good feeling about - based on reviews and holding the camera in your hands - and don't fret too much about all the small technical details. After all, in a mere two years from now the features on these cameras might be completely different. This new section of the digital SLR newsletter will introduce you to an article on the digital SLR guide that you might not have been aware of. Sometimes I'll feature a newly written article here, and sometimes I'll just dig up an old one. This month, the new article talks all about the new digital SLR cameras of 2009 (a topic that won't be foreign to frequent readers). This article will provide you with an introduction to the features of every new digital SLR camera slated for release in 2009. First, I include a release timeline, so you know when the camera will actually be available for purchase. Then, I provide a brief tour of each camera's features and try to highlight what makes the camera interesting or unique. Needless to say, this page will be updated throughout the year as new cameras are announced and their release dates are confirmed. I do try to update the page within a few days of each new camera announcement so that the information is as current as possible. Well, if you're right on the verge of buying a new digital SLR camera, consult this page BEFORE you buy. What we're trying to avoid here is "buyer's remorse": I'd hate for you to spend a ton of money on last year's model, only to find out that a 2009 model will have all the features you want without a huge jump in price. The two new cameras announced this month include the Nikon D5000 and the Olympus E-450. The video mode on the D5000 lets you capture up to 5 minutes of high-definition (720p) video or 20 minutes of regular video. The included HDMI port means that you can plug the camera straight into any TV that supports HDMI. In addition to its video mode, the D5000 can grab still images with an 11-point autofocus system and a 4 photo-per-second continuous speed. The impressive part is that it packs all of this functionality into a camera body that's light and compact - more the size of a Nikon D60 than the heavier and bulkier Nikon D90. While the D5000 makes some pretty big technical improvements over its predecessor (the D60), the Olympus E-450 is really just an incremental improvement over the E-420. It maintains the same diminutive size and low weight, and adds in 3 art filters (also available on the E-30 and E-620), face detection autofocus and dynamic range control. If you already own an E-410 or E-420 there is relatively little here that necessitates an upgrade. The Olympus E-450 is geared more toward first-time digital SLR camera buyers who want to experience the world of DSLR photography without having to spend a ton of money. 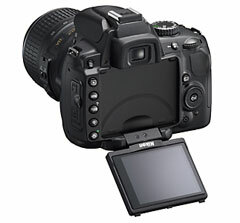 The Nikon D5000 will be released in April 2009, with a kit price of $850. The Olympus E-450 will be released in July 2009, with a kit price of $700 (with TWO lenses). Take the Camera Guide Poll - tell me which camera you'd like to see reviewed next! In the past several issues of the newsletter, I've talked about one of the main features of any digital SLR camera lens: the aperture setting. Since this pretty much covers all the information that you need to know about aperture, I'll now move on to the second most important camera setting: the shutter speed. Every digital SLR sensor sits in the dark behind a shutter. The shutter is actually made up of multiple blades that open and close. These blades work together to expose the sensor to light. When you use a slow shutter speed, the blades open all the way (exposing the entire sensor to light) and then they snap closed. But when you use a fast shutter speed, the trailing blade start to close before the first one is completely open. The entire sensor is never exposed to light in this case - instead, a small sliver of light slides quickly across the sensor (vertically, not horizontally). This explains how some digital SLR cameras are able to achieve a top shutter speed of 1/8000th of a second (pause for a moment to think about just how FAST that is). Unlike apertures - where you have to learn the unintuitive f-stop scale - shutter speeds are measured in something much simpler: seconds and fractions of seconds. Like aperture, there are a common set of shutter speeds that every digital SLR camera can use (you can't just dial in a shutter speed of 1/115th of a second. Since you'll spend most of your time taking pictures in fractions of seconds, camera displays do away with the fractional notation and just list the denominator. For example, a shutter speed of 1/500th of a second will appear on your camera display as 500, while a shutter speed of 1/8th of a second will display as 8. Since the fractional numbers display as whole numbers, a second notation is used when you use shutter speeds longer than a second: a quote appears after the number. A 2 second shutter speed displays on the camera as 2", while a 10 second shutter speed appears as 10". That's the broad introduction - next months we'll dig into the details of shutter speed to find out why it's so important. This tip is for all you first-time digital SLR buyers out there, the ones who are just making the transition from a point-and-shoot compact digital camera. As I mentioned at the beginning of this newsletter, it's getting harder to tell all the new cameras apart since they all include so many features and since they all take great photos. Even though prices on digital SLRs have dropped, these things still aren't cheap. Since that's the case, you can spend a huge amount of time and effort comparing cameras, looking for sales, waiting for the best deal and fretting about whether or not you're getitng the "right" camera. Here's a solution for anyone who's starting to feel overwhelmed with the entire DSLR selection process: buy a 2 or 3 year old used camera. Maybe at this very moment you simply can't make up your mind about whether you'd ever use face-detection autofocus or a LCD that flips out from the camera body. The best way to figure out what you really do and do NOT want in a DSLR is to use one for several months. Let's say that you spend a couple hundred on a digital SLR that has just the basic feature set (like a Canon Rebel XT/350D or the Nikon D40). Now, you just need to take that camera and photograph everything around you. As you take more pictures, you'll begin to get a sense of your photographic style (i.e. the subjects you photograph most often). Once you know what you love to take pictures of, you'll also begin to get a sense of how the camera you're using is limited. Once you understand these limitations, you can go out and find a new digital SLR with features that overcome these limitations. The best part about buying a used digitial SLR to begin with is that you can pick one up for HALF the cost of a new one. Since you're spending a lot less money, the used camera you buy doesn't have to be perfect - it just has to be your introductory SLR that you use to find the "perfect" camera. Hundreds of used digital SLRs are available on eBay US (and also at eBay UK and eBay AU), so there are plenty of options to choose from. When buying used, the most important thing to ask the seller is "how many photos have been taken with the camera?" (this is also called the number of shutter actuations). Digital SLR cameras are designed to take tens of thousands of photos without missing a beat. However, a camera that's taken only 5,000 pictues should last longer once it gets to you than one that's already taken 50,000. Not sure what features are available on the older camera models? Download my Digital SLR Timeline to get a list of every consumer digital SLR released since 2005. Just when I was about to get started on a review of the Canon XS, Nikon releases the D5000 and Canon comes out with the new T1i. Reviews of those two cameras have moved to the top of my list, so I hope to have a lot more in-depth information about both of them available soon on the site.